The volume is up and the boogie is on! Remixes 2012 recycles old ideas from different genres of music to create a harmonic puzzle of sensory perception through the art of remix. Four mind-twisting, cross-genre remixes are now ready to take you away! 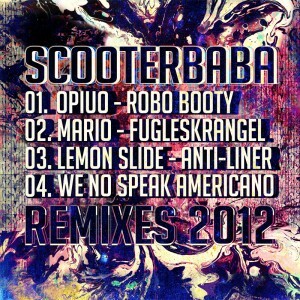 All tracks remixed and produced by Scooterbaba. Mastered by Charles Michaud (aka Tryptik). Cover art by Olpek. MP3 Download | FLAC Download | WAV Download · Download count: 6,549. Спасибо, ужжасно соскучился по ним))) Отличный ремикс!